PC platform with extremely high industrial compatibility for demanding tasks in the field of PC-based automation. Rugged construction: The PC is resistant to even the harshest mechanical stress and is extremely reliable in operation. The SIMATIC IPC677D is designed for use directly on-site at the machine. The shallow installation depth of just 112/133 mm means it can also be operated in confined spaces. The PC can be used in production automation as well as in process automation and can be mounted in control cabinets/consoles and swivel arms (booms). Thanks to the Multi Core CPUs with Intel Core technology, high-performance control and visualization are possible simultaneously. With PCIe (x16), the new PCI Express cards (x1, x4 and x8) are also supported. The integral NVRAM (battery-backed) is supported by WinAC RTX with DC or AC power supply, devices with PROFIBUS or PROFINET (IRT capability) are equipped with this. Siemens offers the complete modular system of harmonically matched automation components. The SIMATIC HMI lPCs can be ordered in conjunction with WinCC flexible or WinCC as SIMATIC HMI packages at a price advantage (see SIMATIC HMI complete systems). The SIMATIC IPC677D comprises a computer unit and an operator control unit. All control units fulfill the requirements of IP65 degree of protection. The analog resistive operator control units feature a USB 3.0 port on the front for connecting external peripheral devices, such as a mouse or keyboard. The computer unit is connected via a connecting cable attached at the rear of the operator control unit. 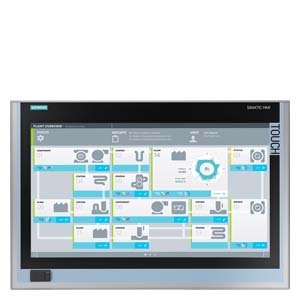 A distributed configuration can be set up with the SIMATIC IPC627D and the SIMATIC Industrial Flat Panel monitors. The monitor can be placed up to 30 m away while retaining front functionality (incl. rear USB interfaces). Flat-panel monitors are available in different versions as devices without operating functionality or with touch or touch/key operation. For additional information, see "Expansion components". The integral Ethernet interfaces (10/100/1000 Mbit/s) can be used for IT communication and for data exchange with PLCs such as SIMATIC S7 (with "SOFTNET S7" software packages). The isolated PROFIBUS interface (12 Mbit/s) can be used for connecting distributed field devices or for connecting to SIMATIC S7 (with "SOFTNET for PROFIBUS" software package). The three (IRT-enabled) PROFINET ports can be used to connect distributed I/O, SIMATIC S7 and drives. The switching-enabled ports of the CP1616-compatible PROFINET option support linear bus and tree topologies (WinAC RTX from Version 2008). Alternatively, the interface can be used as a standard Windows interface. For connecting additional I/O devices, 2 free slots for PCI or PCIe modules, 5 USB 3.0 (Universal Serial Bus) interfaces, and one serial interface are available. All dimensions in mm. For mounting cut-out, see Technical Specifications.